After the National Anthem and some introductory remarks by the maestro, a teacher from Chattanooga, Tenn., addressed a crowd at the Palladium Tuesday about the short work they were about to hear from the Tampa Bay Symphony. “This piece is about community,” said Kenyon Wilson, whose composition, Five, honors four Marines and a Navy sailor killed in 2015 at two military installations in Chattanooga. The piece took second place in the community symphony’s first composition contest last year. Wilson likened his musical memorial to the drive-by shootings to a symbolic “empty chair,” and noted that two of the victims were musicians. Its somber opening with church bells blossomed into a sweetness of strings. The rest of this five-minute rumination featured tympani and horns, an suggesting order and harmony the ultimate sacrifices of those who serve. The stage lights went all the way down at the end, as conductor held his baton aloft and the audience observed an impromptu silence. It was an appropriate beginning to the symphony’s winter concert series, East Meets West. These musicians and their supporters do constitute a community. They don’t get paid yet perform serious work, which in this series includes Tchaikovsky’s Symphony No. 2, better known as the “Little Russian.” And they have improved a lot over the last couple of years. 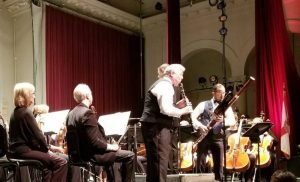 Music director Mark Sforzini introduced each piece with a chatty informality, the way a backyard neighbor tells you how he grew the tomatoes. The arrangement of America the Beautiful that came next was dedicated to former Tampa Bay Symphony conductor Jack Heller, who favored it. Sforzini soon reemerged with his bassoon in the evening’s highlight, the world premiere of his Concerto for Clarinet and Bassoon, or “Premium Blend.” The piece and its name come out of a 15-year bond between Brian Moorhead, who retired from the Florida Orchestra last year as its principal clarinet, and Sforzini, the orchestra’s former principal bassoonist. Upon his retirement, Moorhead and two other backers commissioned the piece for Sforzini to write in honor of the musicianship they shared. The two men first played the duet at a clarinet conference last year, but this is officially its premiere. Sforzini, who is also music director of the St. Petersburg Opera, told a family story about growing up in Alabama as the youngest of seven. He pointed out two musical influences in the audience — brother Andy, who played the trombone, and sister Suzanne Simonelli, who played piano — who helped him get to the all-state high school band, hence here. He praised the orchestra for performing “with heart and appreciation for what they were doing.” David Stech, an assistant conductor of the St. Petersburg Opera, conducted the piece, which began with playful dialogue between bassoon and clarinet. Harmonies raced upward, spilling over each other. The orchestra took on a fuller supporting role as it slows down a bit, as if settling in for the ride. It’s a sophisticated piece hinting at scores of orchestral moments over years of playing together, the bright bursts and tempo changes of symphonies themselves, their dialogues and reflective interludes, and of the notes of a long friendship. The orchestra concluded with the Little Russian, which Tchaikovsky based on Ukrainian folk tunes. Its four movements recall the majestic sweep of the Volga River, a bouncy march, a rapid folk dance and an intense climb to the finale. Countless times they demonstrated that they are in fact an orchestra, not musicians playing scores. They came together in tone and tempo, finishing a difficult symphony on pitch and on time. The Tampa Bay area is lucky to have them. Mark Sforzini of Auburn, Ala., does his thing on the MGM Grand Hotel stage in Las Vegas for a segment of the Dinah television show. 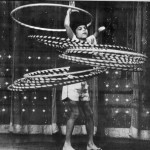 At age 10, he won the World Hula Hoop championship. Always striving to achieve, the young Sforzini was also a state diving champion.